Document Exploitation: WWII Captured German Documents: "we can 'lose' some if we wish"
WWII Captured German Documents: "we can 'lose' some if we wish"
The U.K. National Archives are providing an increasing number of copies of its records online. 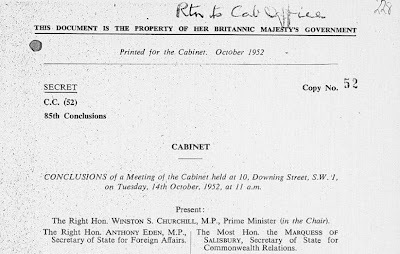 An interesting example that illustrates the importance of retaining notes of meetings (and not just final memoranda) for adequately documenting government activities and also demonstrates that concerns about the integrity of captured documents in foreign custody are not just conspiratorial is the record of a cabinet meeting discussion of captured German archives from October 1952. Attendees at the meeting included Prime Minister Winston Churchill, Secretary of State for Foreign Affairs Anthony Eden, and Secretary of State for War Anthony Head. The participants discussed the status of negotiations for the possible return of captured German diplomatic and military documents. Thanks to thoughtful records retention, what survives from the meeting is not just the formal memorandum, but also the notes that were taken at the meeting. When the notes are consulted the discussion of the German archives appears to have had a different tenor and indeed some different content. Attributed to Secretary State for Foreign Affairs Anthony Eden is a statement that the U.K. could copy the documents before they are returned to German and that "we can 'lose' some if we wish." Moreover, in contrast to the formal memorandum that speaks of granting the Minister of Defence discretion to "withhold" documents, the notes of the meeting conclude that that the "M/D" [Minister of Defence] with "C.O.S. "[Chiefs of Staff] will have "discretion to destroy." 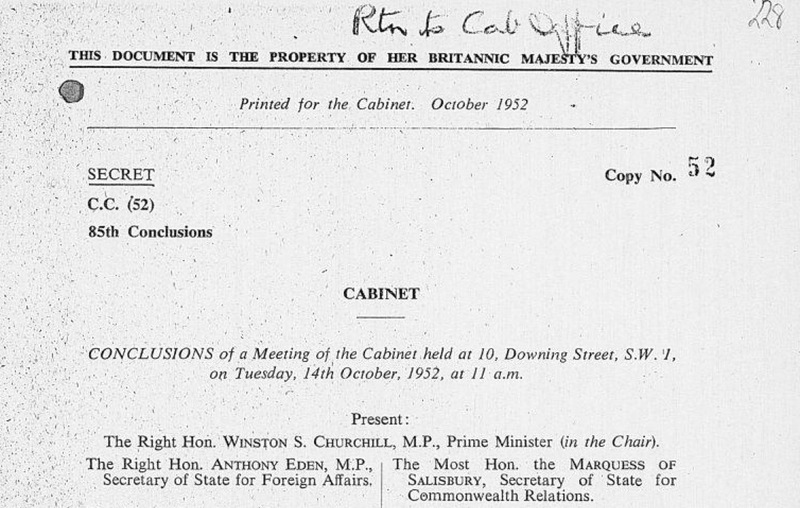 I am posting here the full memorandum and the notes of the meeting, courtesy of the U.K. National Archives.